What is stk500 version 2? 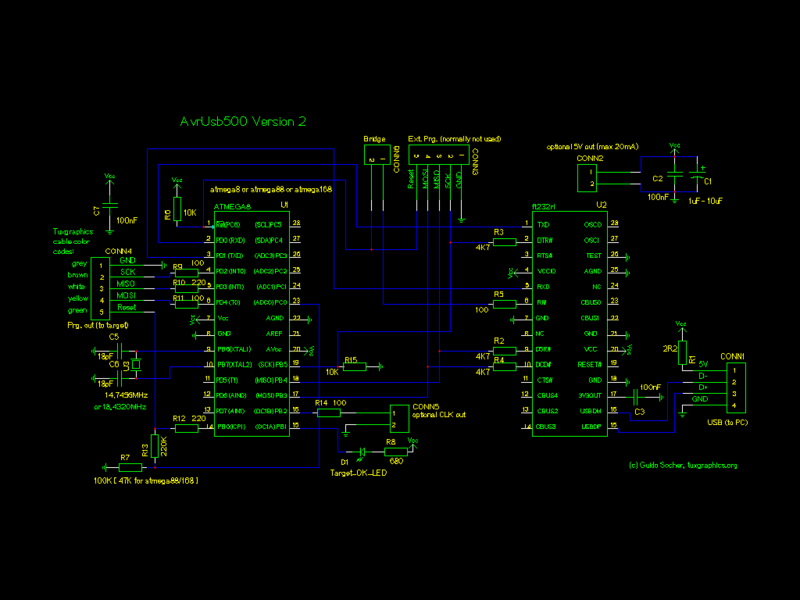 This is a re-design of the popular avrusb500 programmer. The second version of avrusb500: avrusb500v2. When I started to develop the original avrusb500 during spring 2005 I had a modern programmer in mind. It should have a USB interface but have no "chicken and egg problem". That is: you should be able to build it from scratch without the need of another programmer to load the initial firmware. It should also be device independent. That is: should be possible to program current and future AVR microcontrollers without the need to modify the programmer for every new chip. The result was avrusb500. The led indicates now if the programmer is correctly connected to the target. This is a very useful feature as it is often not so obvious which way round the connector should fit onto the target board. A 1MHz emergency clock signal is provided. 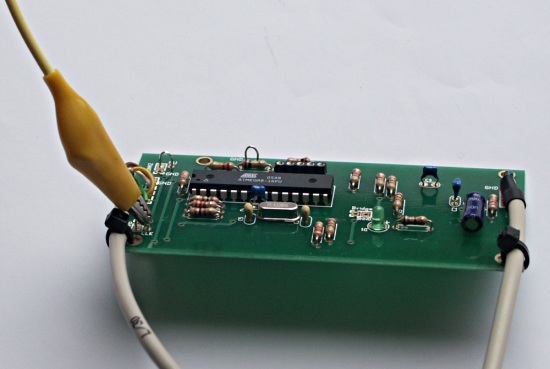 This can be used to recover a chip which was accidentally programmed with the wrong fuses. Explanation: Atmel calls their configuration bits "Fuses". They have however nothing in common with traditional fuses. They are bit patterns which can be used to configure the startup behavior of the microcontroller similar to the BIOS in a PC. They can be modified as needed at any time (they don't burn like a real fuse) but within limits: If you accidentally program the AVR fuses for an external crystal but the hardware does not have such a crystal or the wrong crystal type then your hardware will be "dead". It is possible to recover such "dead" hardware by connecting the 1MHz clock output to the XTAL1 pin of the AVR and then re-program the fuses to the correct value. The firmware for avrusb500v2 is again open source and programmed in C.
A link to the older (version 1) avrusb500 can be found at the end of this article. Until not so long ago many programmers had specific knowledge about the possible target micrcocontrollers burned into the programmer. stk500 is a development board from atmel but it works also as programmer and the communication protocol between your PC and that programmer is therefore often called just stk500. stk500 version 1 was such a device dependent protocol. It needed updates for every new programmer that came out. At last Atmel had a good idea and developed a protocol which had some more generic procedures. This was then called stk500 version 2 and the exact specification is AVR068. There is also a more recent variant called AVR069. The stk500 AVR068 specification needs no longer device dependent data structures in the programmer hardware. All device dependent logic is now in the programmer software running on the PC. As of today avrstudio (for windows) and avrdude (for multiple OSs including Linux) support this version 2 of the stk500 protocol. The physical hardware interface to the PC is USB. This way we can build a fast and modern programmer which can be used under Linux, BSD, Windows, MacOS X and others. The avrusb500v2 programmer is an In System Programmer. That is: you do not have to remove the microcontroller from the circuit. Almost all Atmel microcontrollers have for this purpose an interface called SPI (Serial Peripheral Interface). The microcontrollers can be either spi master or spi slave. A spi slave is the microcontroller which is programmed and the programmer is the master. The master is controlling the clock (pin SCK) on the SPI interface. The purpose of the programmer is therefore to "convert" the stk500 protocol to spi commands. To run spi directly over usb would be too slow for normal programming and development. The spi protocol is implemented in the microcontroller hardware. The corresponding pins can used as output (master) when it has to function as a programmer or as input (slave) when you load software into the chip. Since we need the input pins needed for "solving the chicken and egg problem" and the atmega8 has a limited amount of clock speeds for the hardware spi we will use some generic IO pins as output and avrusb500v2 will therefore implement spi in software. The stk500 protocol defines a message format and appropriate commands such as CMD_SET_PARAMETER, CMD_LOAD_ADDRESS, CMD_PROGRAM_FLASH_ISP etc... The protocol sends chunks of data and this is very suitable for USB. The whole protocol is documented in the application note AVR068 (stk500 V2) from Atmel. This stk500 v2 protocol must not be confused with AVR061, which is version 1 of the stk500 protocol. Atmel has done a complete re-design. (Side note: avrusb500v2 and the older avrusb500 implement both the stk500 V2 protocol). A common solution is to sell microcontrollers with a pre-loaded boot loaded. The problem here is that those special microcontrollers are then specific to one vendor. They are not off the shelf microcontrollers. For the usb interface we use a FT232rl chip. This chip has an interesting mode called "bit-bang" mode. I have written a source code library called ftdibb (only 2 files .c and .h, available from http://tuxgraphics.org/~guido/) which implements this bitbang mode on top of the libUSB library. LibUSB (http://libusb.sourceforge.net) uses the /proc file system to send and receive custom usb messages to any usb device on the usb bus. A slight drawback is that this requires root permissions under Linux it is a slow process as we will send very short messages. Initially (when there is no firmware on loaded in the microcontroller) we have absolutely no storage place and no logic in the programmer. We must send all the commands directly from the PC, bit by bit. USB is fast when you send long chunks of data but it is very slow when you send only 1 bit at a time. The initial firmware needs to be loaded only once. There is no customer lock-in with special AVR chips. Any of the shelf atmega8/atmega88 will work. In other words the avrusb500v2 consists really of two programmers: One slow internal for the initial loading of the firmware and the actual avrusb500v2 programmer which is a very fast and stk500 V2 based programmer for every day use. I called the bitbang programmer for the initial loading "bbpg". I have modified the uisp programmer software for this purpose. You need to download uisp-20050207.tar.gz and then apply the uisp-20050207-usb-bbpg-patch.txt patch (cd uisp-20050207;patch -p1 < uisp-20050207-usb-bbpg-patch.txt ) or you can take the already patched sources (uisp-20050207-usb-bbpg.tar.gz, download at the end). Libusb needs to be installed before you compile the bbpg programmer. The avrusb500v2-X.Y.tar.gz package contains also a patched and pre-compiled binary. If you want to save some compile time then try this one first. You must name this version of uisp "uisp_bbpg". This is what the makefiles and scripts expect. The CD which is sold from http://shop.tuxgraphics.org together with the parts for this programmer can also be used for the initial loading of the firmware. It has the additional advantage that you can do this from the CD without root permissions. The specification from Atmel for the STK500 V2 communication protocol is 37 pages long. It is however not a problem to fit it into an atmega8 microcontroller. It fills about half of the available memory. Here is the schematic drawing. The right side is the usb to rs232 conversion circuit to provide usb connectivity to the atmega8/atmega88. The whole circuit is self powered. That is: unlike may other programmers you do not need additional pins to draw the power from the target circuit. We need an external crystal for the atmega8/atmega88. This is because the UART for the serial communication via usb needs to run at 115.2K baud and this can only be done with a crystal. Why do we need 115.2K baud? 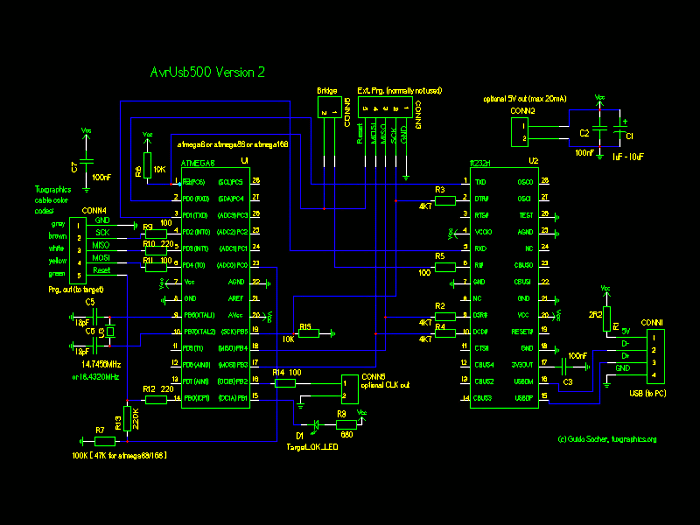 This is mainly because Atmel has designed it's avrstudio software this way. The hardware can work with either atmega8 or atmega88/atmega168 because I have written the software such that it can be compiled for both platforms after configuring the right platform in the Makefile. The background is that theoretically the atmega8 can be clocked up-to 16MHz and the atmega88/atmega168 up to 20MHz. The fast clock speed is needed because the SPI interface to the target is implemented in software and in order to get a fast AVR programmer we need the speed. In other words if you want to follow strictly the specifications then you should use 14.7456MHz for atmega8 or 18.4320MHz for atmega88/atmega168. It turns however out that minimal overclocking of the atmega8 is not a problem as long as the power supply voltage of the atmega8 is close to 5V. The atmega8 has as of today probably the best price to feature ratio. My recommendation is therefore: use atmega8 and a 18.4320MHz crystal. A new and really useful feature is the target connector polarity recognition. The tuxgraphics connector is symmetric with standard color codes. The Atmel 10 and 6 pin connector have a notch but very often the target boards have just the plain pins coming. No damage is done if the connector is inserted the wrong way round but it is still annoying if you have to troubleshoot why the programmer does not seem to work. avrusb500v2 has now an LED which goes on as soon as the connector is correctly inserted. A main source of troubles is therefore eliminated. 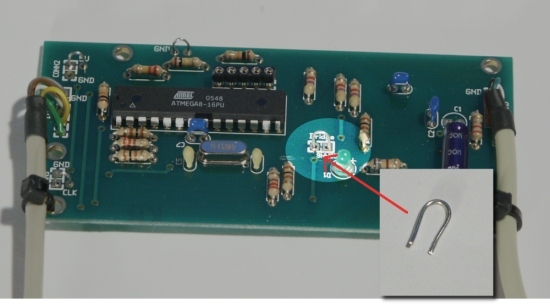 The connection from the target reset pin to ADC0 is used for this purpose. There is also and output for the 1MHz emergency clock signal (CONN5) and a 5V output to power a target (CONN2) if needed. Be however aware that there are no fuses or current limiting components on CONN2. No more than 20mA should be taken from CONN2. 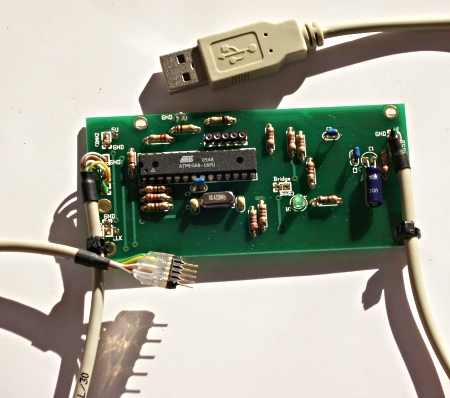 If you want a fused USB power supply to power external hardware from the USB bus of you computer the I can recommend the 5V mini power supply, USB (http://shop.tuxgraphics.org/electronic/microcontroller.html#usbPowerOnTheRoad). avrusb500v2 has this self boot-strapping feature which makes it possible for anybody to build this hardware with out the help of others to get the first firmware loaded. For this purpose the connections between the MOSI, SCK, MISO pins and the ftdi chip are needed. Those pins would however also be needed if we would use the hardware SPI in the atmega chip towards the target. The old avrusb500 required therefore a 5 pin bridge cable. The new avrusb500v2 implements the SPI towards the target in software. Any pin can therefore be used as output towards the target. Just the reset pin is, for safety reasons, connected and disconnected after the initial firmware loading. An additional advantage besides removing the 5 pin bridge cable is that we can do much more speeds in software. The hardware spi has a frequency pre-scaler and this determines immediately how many different SCK speeds can be implemented. In software there is no real limit (however it makes no sense to implement an endless number). The rest of the software (largest part of the software) is about the implementation of the stk500v2 protocol towards the PC. I have designed the hardware such that conventional parts can be used for almost all components. Only the ft232rl is a SMD chip. Its a very compact new chip but it has the problem that it comes only in very tiny packages not usable for soldering at home. Especially if you have just a standard soldering iron. The tuxgraphics online shop sells therefore the boards with this chip already soldered on. The software package (avrusb500v2-X.Y.tar.gz) contains a README.htm file. Please read it first. Double check the polarity of the USB connection. Incorrect polarity will destroy the circuit. This shows that the ft232 is working. This will load a test program into the atmega. but please have a look at the README file for details (command: more README.htm or open it in a web-browser). Loading of firmware is done under Linux only. The programmer is however OS independent once you have loaded the firmware. from the unpacked avrusb500v2-X.Y package. That's all. If you do not have this CD then you need to build first the special version of uisp which contains the ppbg programmer (see above). The README.htm file inside the avrusb500v2 package describes this procedure also. Loading of the firmware takes very long time due to the huge overhead you get on the USB bus when you send just one bit at a time. You can calculate approximately 15minutes for loading and 10minutes for verification. avrdude is the software needed to use the avrusb500 programmer under Linux or Max OS (http://savannah.nongnu.org/projects/avrdude/). You need version 5.X (or higher). I recommend also some kind of pull relief for the cables. A cheap and reliable solution is to use cable straps and tie the cables to the board. 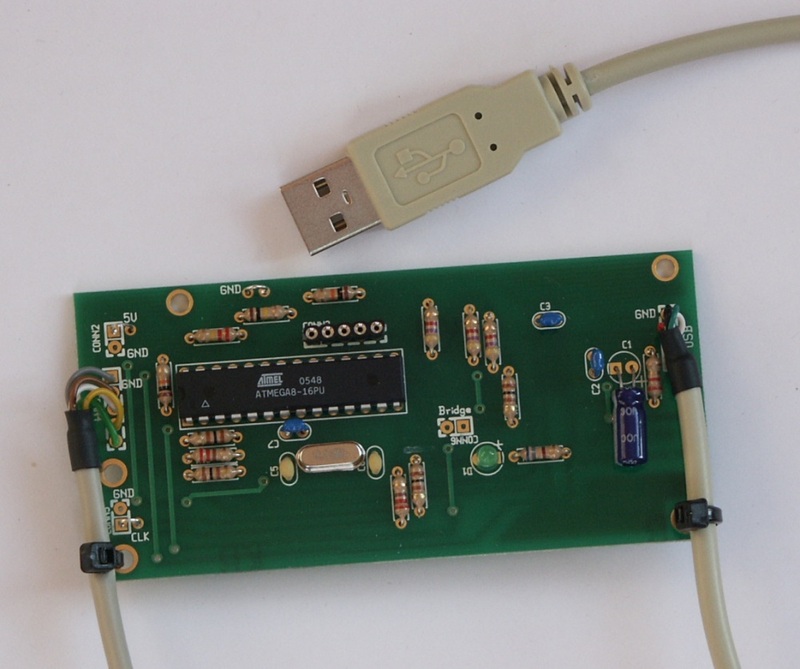 This is a modern USB based AVR programmer which can be build from scratch without the need to find a programmer to program the programmer. If you like this type of articles then have also a look at http://shop.tuxgraphics.org. It is always nice to see that there are people who support my work. Have fun and happy soldering!